Afyonkarahisar (Turkish pronunciation: [afjonkaɾahiˈsaɾ], Turkish: afyon "poppy, opium", kara "black", hisar "fortress") is a city in western Turkey, the capital of Afyon Province. Afyon is in mountainous countryside inland from the Aegean coast, 250 km (155 mi) south-west of Ankara along the Akarçay River. Elevation 1,021 m (3,350 ft). 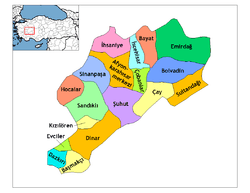 Population (2010 census) 173,100  In Turkey, Afyonkarahisar stands out as a capital city of thermal and spa, an important junction of railway, highway and air traffic in West-Turkey, and the grounds where independence had been won. In addition, Afyonkarahisar is one of the top leading provinces in agriculture, globally renown for its marble and globally largest producer of pharmaceutical opium. Afyon has unique marble types and colors, which were historically very renown and are unique to Afyon. Like "Afyon white", historically known as "Synnadic white". "Afyon Menekse", historically known as "Pavonazzetto" and "Afyon kaplan postu", this type wasn't popular. Historically marble from Afyon was generally referred to as "Docimeaen marble". Docimian marble was highly admired and valued for its unique colors and fine grained quality, by ancients such as Romans. When the Romans took control over Docimian quarries, they were blown away about the beautiful color combinations of Docimian Pavonazzetto, which is a type of white marble with purple veins. A trend started about it right away. Emperor's Augustus, Trajan, Hadrian, all made extensive use of Docimian marble to all their major building projects. Docimian marble was also preferred for sarcophagi sculpting, some emperor's preferred this marble for its high value and majestic looks. As a result, one of the greatest masterpieces were made from this material. Such as sarcophagus of, Sidamara, Silifkeh, Seleukeia, Eudocia, Heraclius....several hundreds sarcophagi were constructed. sucuk - the famed local speciality, a spicy beef sausage, eaten fried or grilled. The best known brands include Cumhuriyet, Ahmet İpek, İkbal, İtimat. Victory Museum (Zafer Müzesi), a national military and war museum, which was used as headquarters by then Commander-in-Chief Msutafa Kemal Pasha (Atatürk), his chief general staff and army commanders before the Great Offensive in August 1922. In the very city center, across the fortress, featuring maps, uniforms, photos, guns from the Greco-Turkish War. ↑ Lewis Thomas (Apr 1, 1986). Elementary Turkish. Courier Dover Publications. p. 12. ISBN 978-0486250649. ↑ Evren Ekiz (2016). termal turizmde farkli bir destinasyon: jeoturizm (afyonkarahisar örnegi) (PDF). p. 70. ↑ Rosie Ayliffe (2003). TURKEY. p. 606. ↑ Erica Highes (2013). Meaning and λόγος: Proceedings from the Early Professional Interdisciplinary. University of Liverpool. p. 29. ↑ US Department for State Bureau. International Narcotics Control Strategy Report. p. 388. ↑ Central Bank of the Republic of Turkey. Banknote Museum: 1. Emission Group - Fifty Turkish Lira - I. Series Archived March 5, 2009, at the Wayback Machine.. – Retrieved on 20 April 2009. ↑ Belkıs ÖZKAR. mermer sektöründe katma degerin ve ihracatin artirilmasi (PDF). p. 29. ↑ Dilsad Erkek. Mermer ve Traverten Sektörüne Küresel ve Bölgesel Yaklaşım (PDF). p. 25. ↑ Sevgi Gürcan. Türkiye ve Afyon'da mermer sektörünün gelisim trendi, Kocatepe University (PDF). p. 389. ↑ Nuran Tasligil. Die Analyse der als Baumaterial genutzten, Marmara University. p. 619. ↑ Barbara E. Borg (2015). A Companion to Roman Art. p. 157. ↑ Strabo. Geography. "Book 9, chapter 5, section 16"
↑ Donato Attanasio (2003). Ancient White Marbles. p. 154. ↑ Donato Attanasio (2003). Ancient White Marbles. p. 157. ↑ Anthony Grafton (2010). Classical Tradition, Harvard University. p. 842. ↑ William Lloyd Macdonald (2002). The Pantheon, Harvard University. p. 86. ↑ J. Clayton Fant (1989). Cavum Antrum Phrygia. p. 8. ↑ Kathleen S.Lamp (2013). A City of Marble, University of South Carolina. ↑ James E. Packer (2001). The Forum of Trajan in Rome. p. 120. ↑ Ben Russell (2013). The Economics of Roman Stone Trade, Oxford University. p. 229. ↑ John W. Stamper (2005). The Architecture of Roman Temples, Cambridge University. p. 137. ↑ John W. Stamper (2005). The Architecture of Roman Temples, Cambridge University. p. 136. ↑ Max Schvoerer (1999). ASMOSIA 4, University of Bordeaux. p. 278. ↑ Gilbert J. Gorski (2015). The Roman Forum, Cambridge University. p. 19. ↑ Gregor Kalas (2015). Restoration of The Roman Forum in Late Antiquity, University of Texas. p. 43. ↑ L. Richardson (1992). A New Topographical Dictionnary of Ancient Rome, The Johns Hopkins University. p. 176. ↑ Lawrence Nees (2015). Perspective on Early Islamic Art in Jerusalem. p. 107. ↑ The Economics of the Roman Stone Trade, Oxford University. 2014. p. 324. ↑ Janet DeLaine (1997). The Baths of Caracalla. p. 32,70. ↑ Dante Giuliano Bartoli (2008). Marble Transport in the Time of the Severans, Texas University (PDF). p. 154. ↑ Nadine Schibille (2014). Hagia Sophia and the Byzantine Aesthetic Experience, University of Sussex. pp. 241–242. ↑ Keith Miller (2011). St. Peter's, Harvard University. p. 110. ↑ Ben Russell (2014). The Economic of the Roman Stone Trade, Oxford University. p. 28. ↑ Barbara E. Borg (2015). A Companion to Roman Art. p. 124. ↑ Abu Jaber; N. Bloxam. QuarryScapes, Geological Survey of Norway (PDF). p. 102. ↑ Marc Waelkens (2000). Sagalassos Five, Leuven University. p. 339. ↑ Donato Attanasio; Mauro Brilli (2006). The Isotopic Signature of Classical Marbles. p. 151. ↑ Kurtulus Karamustafa; ömer Sanlioglu; Kenan Gülle (2013). 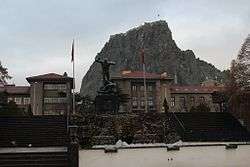 Ulusal Turizm Kongresi, Erciyes University. pp. 245–246. ↑ Prof.Ergün Türker; Ahmet Yildiz (2008). Termal ve Maden Sulari Konferansi, Afyon University (PDF). p. iX. ↑ plantation Office Archived October 7, 2013, at the Wayback Machine. ↑ Zohara Yaniv; Nativ Dudai (2014). Medical and Aromatic Plants of the Middle-East. Institute of Plant Sciences. p. 328. ↑ foundation of egg producers (2015). Yumurta Tavukculugu verileri (PDF). p. 4. ↑ "Meteoroloji" (in Turkish). Retrieved 8 January 2016. ↑ "Müzeler-Zafer Müzesi (Başkomutan Tarihi Milli Park Müdürlüğü)" (in Turkish). Ayfonkarahisar İl Kültür ve Turizm Müdürlüğü. Retrieved 2015-08-10. ↑ Stanford, Jay Shaw (1976). History of the Ottoman Empire and Modern Turkey. Cambridge University. pp. 239–241. ISBN 9780521291668.